The wars in Iraq and Afghanistan placed large numbers of women in combat, arguably for the first time in history. The literature of the two wars features large numbers of women authors, again arguably the first time such a thing has happened. Searching for historical precedents, one might examine the work of British authors Virginia Woolf and Vera Brittain, whose novels in the 1920s and 1930s featured both scenes set during World War I and characters whose lives were affected by the war long after it was over. Each author had family members killed in World War I—Woolf a brother-in-law and Brittain a fiancé and a brother—oh my–and Brittain also worked as a nurse during the war, which might help explain why they made war central in their novels. Woolf and Brittain established a promising precedent for future women war authors, but not much following World War II, Korea, Vietnam, and the twentieth century’s smaller wars capitalized on their strong examples. Beginning with the publication of Siobhan Fallon’s You Know When the Men Are Gone (2011), Helen Benedict’s Sand Queen (2011), Toni Morrison’s Home (2012), and Roxana Robinson’s Sparta (2013), however, we now find ourselves in the midst of a flourishing boom of fiction written by women about war. Other recent books such as Katey Schultz’s Flashes of War (2013), Hilary Plum’s They Dragged Them Through the Streets (2013), Masha Hamilton’s What Changes Everything (2013), Cara Hoffman’s Be Safe I Love You (2014), and let’s not forget J.K. Rowling’s detective novel The Cuckoo’s Calling (2013) signal the very serious intent of women authors to expand the male-drawn boundaries of war lit. To examine this body of work in detail, a good start point is Schultz’s Flashes of War. Containing thirty very short stories set in Iraq, Afghanistan, and back in America and an editorial postscript in which Schultz explains her rationale and process, Flashes of War bumps forward the possibilities inherent in war literature in several interesting ways. In her “Epilogue,” Schultz, who is not a vet, describes fiction as a means of understanding two wars she knew little about. “As someone inclined to make sense of the world through story, I knew my window into these wars would have to be narrative,” she writes. Not interested in history or journalism, she found herself drawn “to intimate moments of a soldier’s or civilian’s life. Images, decisions, and thoughts so small and experienced under such strain that even an interview with the most forthcoming individual could not unearth them.” Inspired by YouTube videos and news snippets garnered on the Internet, Schultz explains, “Eventually, I filled myself with enough information to precisely imagine my way toward fiction I could believe in.” That’s smart stuff, I don’t care who you are—almost to the heart of what I most appreciate about fiction. With the burqa, it was like this: the world came at me in apparitions, every figure textured by the mesh filter in front of my eyes. In a city with so much death, it was easy to believe half of the people I saw were ghosts. Women sat like forgotten boulders along the sidewalks in Kabul. We begged. We prayed. At the party—a welcome home thrown by his brother—he’d expected the backslapping and WMD jokes that came later that evening. Even the uncertain gazes from folks who probably thought he’d been killing Iraqi citizens. What he hadn’t expected was this: the soft-eyed looks all the girls gave him, the respectful nods from guys he didn’t even know. In the ten seconds it took Bradley to hop out of his truck and walk across Jared’s yard, the entire party’s eyes found him. He felt their attention like a shot of adrenaline. He’d been places since graduation. He must know things now; he might even be traumatized. And brave. Surely he was very, very brave. The number and brevity of Flashes of War’s tales are two of its virtues. Schultz ingeniously injects enough detail, variety, characterization, and plot into each to make one wonder and, better, eager to see what comes next. Not every book needs to be War and Peace, and in an age of rapid-fire Internet reading habits, stories that hit quick and hard and get out fast definitely have their place. While the battle of words rages on about whether a non-veteran can write realistic and compelling war fiction, or even has the right to, with a snide side-skirmish that especially impugns a woman’s ability to do so, thank goodness authors such as Schultz aren’t waiting around for permission to tell their stories. 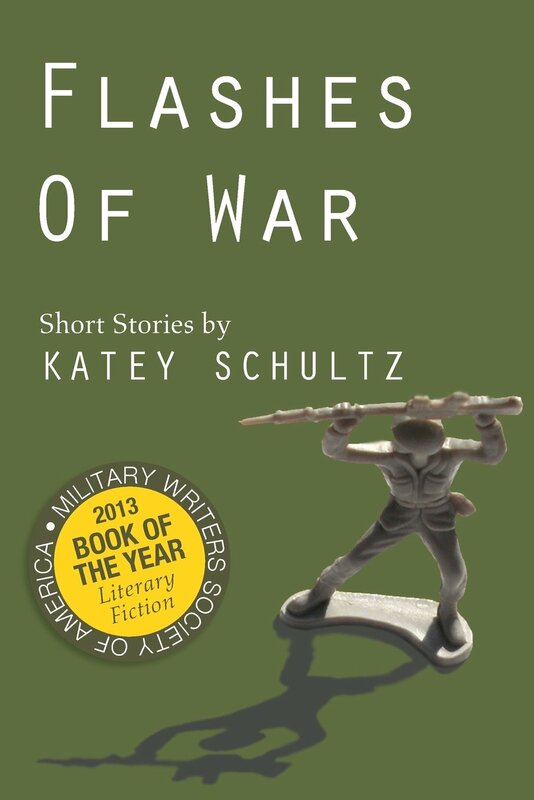 Katey Schultz, Flashes of War. Apprentice House-Loyola, 2013. This entry was posted on August 2, 2014 at 7:44 pm and is filed under Art and War. You can subscribe via RSS 2.0 feed to this post's comments. It’s been so fascinating to learn about the way these wars are being told — refracted as if by a kaleidescope, through so many artists’ eyes. Thank you! One novel I’m embarrassed to have forgotten to summer is Bobbie Ann Mason’s In Country, which was very popular in its time, but seems to have dropped out of sight recently. But I read it again this spring and enjoyed it very much. The movie is interesting, too–not great, but Bruce Willis plays the male lead and an English actress named Emily Lloyd is fantastic as the female lead (playing a rural Kentucky young woman). Thank you so much for writing this. I have no idea how this review came about, but I am absolutely honored to be included in such great company and it’s refreshing to see a review that so smarty puts women’s war lit into a greater context–and that last line is one I’ll live on for at least a year. Writing is so often a solo sport. It’s keen readers and reviews such as this one that make it feel like we’re in community. Katey, thank you for the kind comments and mostly for writing such a good book. If you remember, we met briefly at AWP in Seattle last year. I look forward to reading whatever you write next and to meeting you in person again. Yes, I do remember – now that I see your name. We’ll have to make up for that lunch I missed, and thank you again. Katey, Jehanne Dubrow just wrote to say that she will be presenting with you at AWP next year. I’ll be there too with Ron Capps, Kayla Williams, and Colin Halloran, and it would be a pleasure to get our two panels together for lunch or dinner. Yes, let’s do it! I would like that very much. I finished this one this weekend and thought it was phenomenal! Well, I certainly agree (per my review)! Schultz has done very well, and some of the stories are gems. Thank you! That means a lot. I appreciate it.